307, 3rd floor, 3rd Eye One, Above Vijay Sales, Opp.Havmor Restaurant,CG Road, Panchvati,Ahmedabad - 380006, Gujarat, India. 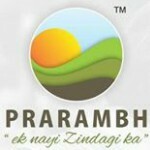 Prarambh is neither a Old age home nor a real estate project but it is a carefully planned and designed lifestyle space tailor made 600 ground floor villas suitable for Retirement life offers care comfort and security along with activities in ever charming eco-friendly environment." Senior citizens are a treasure to our society. They have worked hard all these years for the development of the nation as well as the community. At this age of their life, they need to be taken care of and made to feel special.